You sell advertising for a media company. You believe in the value that your property offers to advertisers. Perhaps you want to be the star salesperson. Perhaps you are more motivated by the ’cause’ than by the money. Perhaps you just want to deposit a bigger commission check. To achieve your goals you must win more new business. Getting appointments with prospects that are hard to reach is the answer. You have already won the easy business from advertisers who are predisposed to know and like your property, but what about the many more prospects that are advertising with your competitor? What about the advertisers in other media forms that should be buying from you? 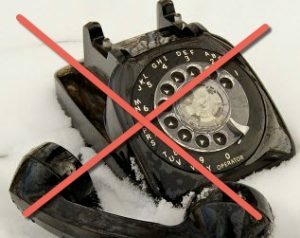 Most advertising sales people avoid cold-calling. It sounds unwanted and unappreciated. 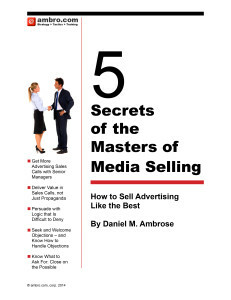 Cold calls tend to to be avoided by the ad-sales person as much as by the targets. But winning new business requires and rewards those who make the commitment and make the effort. You are in advertising. So think of your cold-calling process as an ad campaign for yourself. It will take many impressions to win the prospects’ attention. Those impressions can be delivered through a range of messaging forms. Frequency matters. I recently attended a sales conference where the CEO of an ad agency said that today 24 impressions are required to convert a prospect to a buyer. The old conventional wisdom was 3 impressions were optimum frequency. Today, I would agree your plan needs to deliver more than 20 impressions to be expected to produce results. Build your prospecting campaign with an array of smart messages that will build frequency. Start with a cold-call, followed up with an email. A series of voicemails followed up with emails, both with a smart, client-centric message will build the prospects’ awareness and responsiveness. Then see if you can tweet at your prospects, reach them through Facebook or LinkedIn, and drop off your card for them at a trade-show. When you approach ad-sales prospecting in this way, you are investing your time for success. A few prospects will engage early — only a few impressions into the campaign — that is how you know your “creative” is working. Keep up the drumbeat of frequency and you’ll stand out as the top sales person in time.